Almost in the center of Pattaya, beautiful Villa with private pool. 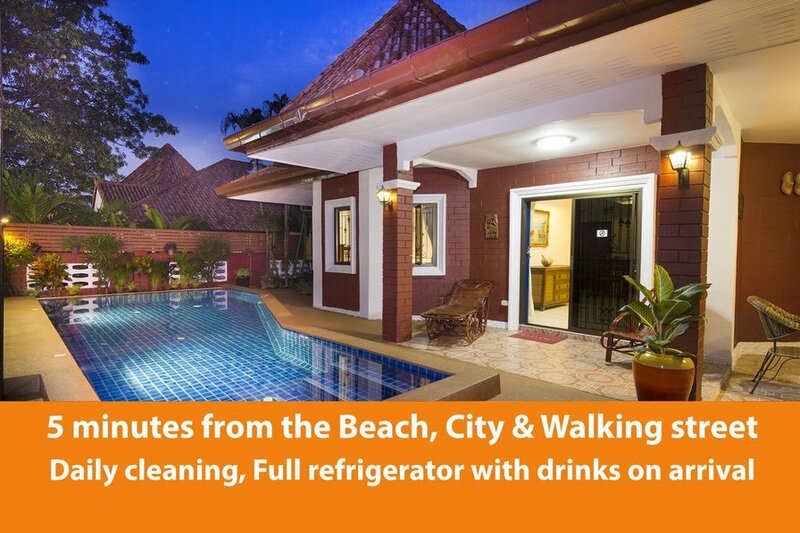 Its not easy to find a villa closer to the city than this, that means that in 5 minutes (scooter) you will be at the beach or in the city of Pattaya with his Walking street and Soi LK Metro for a great night out, also for good restaurants and amazing shopping centers is this the best location to start your holiday. The Villa has a big 4 x 8 meters private pool, is tastefully decorated and has a large living room with open kitchen, 3 bedrooms and 2 bathrooms. All bedrooms have kingsize beds and the house is fully air-conditioned, Master bedroom with ensuite bathroom. In the Living room we have a flat TV and around the house is high speed internet free available. The open kitchen is fully equipped with a big refrigerator, freezer, water cooker, rice cooker, toaster, coffee machine and a microwave. Outside you will find shaded seatings and a BBQ area; the terrace has direct access to the fabulous pool. The garden with palm trees and beautiful flowers is set around the private pool. The size from the swimming pool is 4 x 8 meters with crystal clear water warmed by Pattaya's great weather during the year with his tropical sunshine. On arrival we ask you a security deposit for 200 euro / Dollar or valuta from your own country, you will receive that back when we check you out the day that you leave the villa. After the booking we will send you a separate agreement with more details about the Villa, and also the route to the house. VIP tour Bus, we provide tours around Pattaya with a VIP bus; you will have a private driver to look around pattaya during a day. Information map, on arrival you will receive a map with information about restaurant, bars, tours, golf, and more that can be visit in Pattaya and Jomtien. The Villa has a washing machine but when you don’t want you can bring it to the laudry service just outside the compound. Restaurants, bars and daily grocery you will find within a few minutes walk from the Villa.